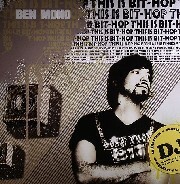 Four track album sampler teasing the second Ben Mono album "Hit The Bit". "This Is Bit Hop" is the antithesis of the current minimal techno sound, slowing down the tempo and merging stripped down hip hop, techno sounds and booming electro. Feat. Bliss & Main Flow, Eddie Ruleclean, Shane Fontane & Kerry L. Dooley. Ben Mono - ambitious multi-player, producer, remixer and in demand DJ from Munich - has built himself a solid reputation in the world of advanced diskotainment during the past years. His debut album "Dual" was praised by critics for being "complex, deep, tight and authentic at the same time" (De:Bug). This second album is a manifestation of a new and unique style labelled by himself as Bit-Hop! Remember when in the late 80s HipHouse was the catalyst for the fusion of rap vocals with electric dance music? It initiated a continuing metamorphose of sound steadily giving birth to new styles like Ghetto Tech, Grime, Dubstep, Hollertronix or most recently Neu Rave. Bit-Hop is the youngest offspring in this family tree. Based on catchy hooks and old school synth lines it can be described best as an amalgamtion of ingredients Ed Banger or Spank Rock would probably feel tasty too. Bit-Hop means the digital merging of different styles, a symbiosis of stripped down HipHop and booming Electro. Bit-Hop also means less beats per minute but more density in sound - a deliberately counterdraft to the current minimal affection of the German electronic music scene. This tastemaking EP combines four key cuts of the album including the two scorching club burners "Don't Stop" (feat. Bliss & Main Flow of Mood) and "Pull Em Down" (feat. electro crunk general Shane Fontane). The futuristic slow motion funk of "Binary Poetry" is blessed by the gifted voice of Weather Girls� backround singer Kerry L. Dooley. Pump up the volume - THIS IS BIT-HOP!